Our LCD Keypad Shield V2.0 is a 2 line, 16 character Arduino LCD display expansion shield, based on V1.0. We have simplified the APC interface and the other GPIO pins and retained 5 input buttons: 1 menu select button and 4 control buttons. 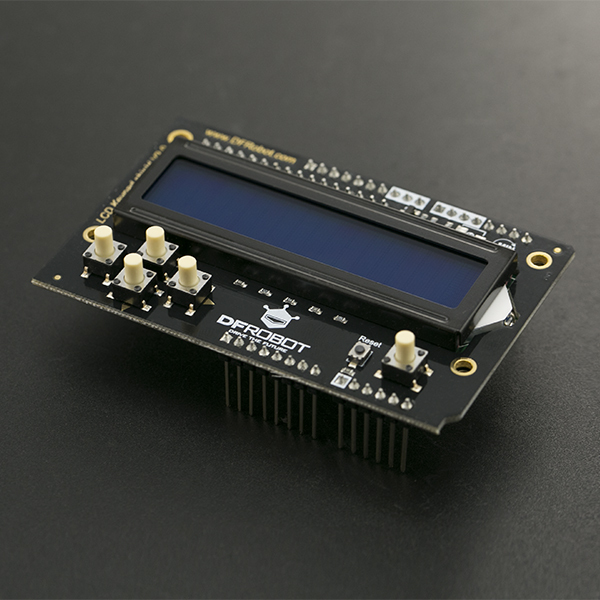 We have provided a simple Arduino library that makes screen driving easier and means you do not have to learn complicated LCD working principles to get it functioning. It is compatible with most Arduino boards, such as arduino UNO and arduino Leonardo. IOREF pin for Version 2: The board's IOREF pin is connected with pin 5V! So when adding the DFR0374 to the stack of board( controller), the controller's supply voltage would changed to 5V! So it only can be compatible with the controller working at 5V. If you need to use controller working at other voltage, e.g. 3.3V, you need CUT OFF the IOREF pin of DRI0009. We are deeply sorry about the mistake! We will revise the design in the next version. Next, open the Arduino IDE and copy the following code to the IDE window. Select the correct serial port (the serial port varies depending on your machine) and board (Arduino UNO). When the code has successfully uploaded, try pressing buttons on the shield observe what happens with the LCD. This program is used to test the LCD module display and 5 buttons. lcd.setCursor(0,1);            // The cursor moves to the beginning of the second line. 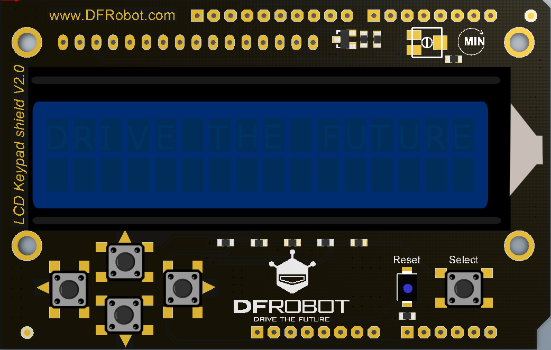 LCD Keypad Shield V2.0 Schematic Get LCD Keypad Shield V2.0 for Arduino from DFRobot Store or DFRobot Distributor.